New Super Luigi U (stylized as New Super Luigi Bros. U) is an expansion game for New Super Mario Bros. U, released as part of the Year of Luigi, celebrating the thirtieth anniversary of Luigi's initial debut. It features Luigi as the main player, with Yellow Toad, Blue Toad, and, notably, Nabbit (who replaces Mario from the original game) playable in multiplayer mode. Although it refers to him, the game does not feature Mario himself at all. The title was first released on the Nintendo eShop on Wii U for region price as downloadable content for New Super Mario Bros. U; the game must be updated to version 1.3.0 before New Super Luigi U can be accessed in-game, and requires 731.4 MB of memory to be installed. Once downloaded, the prompt to access the Nintendo eShop to download the expansion is replaced with a prompt to go to the main menu for New Super Luigi U. Support for the Wii U Pro Controller is also included in addition to and the controls in New Super Mario Bros. U. The game was later released at retail as a standalone game for region price, not requiring New Super Mario Bros. U to play. Both games were later released in a compilation known as New Super Mario Bros. U + New Super Luigi U, initially included exclusively in the Mario & Luigi Wii U Deluxe Set bundle, but later released as a standalone Nintendo Selects disc at a price cheaper than either game individually (the precise price is dependent on the region). Comparison of the jump physics in both games. The gameplay is largely similar to its base game, except that the playable characters retain Luigi's higher jump and lower traction from Super Mario Bros.: The Lost Levels. The game has been designed to be more difficult, with each stage starting at only 100 seconds; due to this, however, the courses have also been made shorter than normal while also being packed with enemies and obstacles. While the levels have all been altered from the base game, the world map itself has not been. Elements like items, power-ups, Star Coins, Toad Houses, Enemy Courses, and bosses are retained as such. The multiplayer of New Super Luigi U is also retained from New Super Mario Bros. U. However, because Mario is not featured in this game, Nabbit is instead used as the fourth playable character. As Nabbit, the player cannot take damage from enemies, but cannot use items; however any items collected are converted to 1-Ups at the end of each stage. Players can earn power-ups from Toad depending on the time left upon completion of the level. At 088, a Super Star is given; at 077, a Super Acorn; at 066, a Mini Mushroom; 055, an Ice Flower; 044, a Fire Flower; and 033, 022, and 011 a 1-Up Mushroom. It has been requested that this section be rewritten. Reason: Needs info on enemies. The world map itself is unchanged from New Super Mario Bros. U, but level designs have a drastic makeover. As mentioned above, playable characters and their abilities have changed. The timer for each level is also set to start from 100 seconds and a 100-seconds time bonus is added to the timer after going to the boss door in the towers and castles (150 seconds in All Aboard! and 250 seconds in The Final Battle). Items in red Toad Houses may vary as well. For example, a 1-Up Mushroom is in place of a Super Mushroom. Similarly, Enemy Courses contain only Mini Mushrooms and Propeller Mushrooms, as opposed to only Super Stars. There are no Checkpoint Flags. Many elements of the game are colored green to emphasize Luigi, and all of the levels have a hidden Luigi in a wall or platform (Flying Squirrel Ovation has two). After the game is completed, a Mario Block appears at the beginning of each level. This allows the player to switch to the original game's physics, with lower jumps and better traction. Nabbit is not affected by the block. Nabbit is also playable in single player mode if the player holds down / on the / or on the while selecting a level. If the same trick is done on the Flying Squirrel Ovation level in Superstar Road, the player's Mii is played as instead of Nabbit. There are 82 new courses replacing the original courses from New Super Mario Bros. U with different level names, while the world names are retained. Peach's Castle A grassland area, similar to World 1 from the previous New Super Mario Bros. games, containing mushroom hills and the castle of the princess. It has been taken over by the Koopa Troop and is slowly transformed into Bowser's image until eventually being surrounded by a tornado. By the time the player reaches the castle grounds, it has been transformed into a lava-based area. Princess Peach's castle remains mostly unchanged on the outside but on the inside it is similar to Bowser's Castle from previous installments. This world must be completed to beat the game. Bowser Jr. In every level within New Super Luigi U there is one Luigi image hidden somewhere within the level. There are a total of 83 Luigi sightings, a reference to Luigi's debut year. These images range from 8-bit Super Mario Bros.-esque to his various artworks throughout the series. The way these Luigis are placed in the level ranges from being in the open to being a background detail. 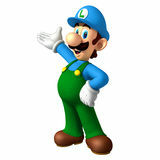 For this subject's image gallery, see Gallery:New Super Luigi U. It has been suggested that audio and/or video file(s) related to this section be uploaded. Specifics: Are the musical tracks the same as New Super Mario Bros. U? During the development process of both New Super Mario Bros. U and New Super Mario Bros. 2, the developers began to think of ideas for downloadable content for the two games. Both teams thought of expanding the secondary modes, New Super Mario Bros. 2 being Coin Rush, and New Super Mario Bros. U expanding on Boost Rush; in the end it was decided that 2 would be the game to receive content first, since it was being released first. However, during the development of the Coin Rush courses the team decided to scrap the idea of additional Boost Rush course packs and began to think of other ideas. The team then began experimenting with the idea of shorter but more difficult courses to replace the ones in the original game. Originally, the downloadable content was being made with Mario in mind. However, when the Year of Luigi came up during a meeting, it was decided that Luigi would be the focus instead. When it was decided to make Luigi the main character, the developers also decided that Mario would be kept out of the game. When deciding on a new fourth playable character, the original idea was to use three Toads, but when testing this it was deemed too confusing; the idea to use Nabbit as the fourth character then came up, reusing his ability to pass by enemies; around that time, the team had also been talking about adding something for beginners, and the idea to use Nabbit was kept. New Super Luigi U was mostly received positively by critics. The game holds a 77 average on Metacritic based on 59 reviews, and a 75.92% on GameRankings based on 36 reviews. GameSpot's Peter Brown gave it an 8.5/10, stating, "Though the world map, themes, power-ups, and visual assets are 'old,' Luigi's physics and the level design at large rise to the top." Chris Carter of Destructoid gave the game an 8/10. He praises the game's design, stating that, "There are a lot of new concepts and designs this time around, and even if a large portion of them are re-used assets, they're remixed in a way that makes its own mark on the franchise." Vince Ingenito of IGN gave the downloadable content a 7.3/10, citing that, "Its smaller levels, restrictive time limit, and floaty physics work well as a challenge mode add-on to an already terrific game," but criticizing that it, "[it] still feels more like an addendum to NSMBU [...] rather than something that stands out on its own." Conversely, Chris Shilling of Eurogamer gave the content a 6/10, criticizing that, "It's not a bad game by any stretch of the imagination: the level design is still a cut above so many of Nintendo's peers. But by the series' consistently high standards, it qualifies as a disappointment.". Edge also gave the game a 6, criticizing the game's stages by saying, "the quality of the level design is mixed: some stages feel claustrophobic yet others are surprisingly baggy, and few are considerate enough to accommodate four players." The writer goes on to say that, "At its best, New Super Luigi U is an exhilarating test of skill," but also criticizes the game by saying that, "on occasion it dangerously approximates a fan-made ROM hack," in the end saying that, "Some will undoubtedly find its challenge inviting, but others will rightly expect more ingenuity from Nintendo than this." GamesRadar writer Henry Gilbert, giving the game 3/5 stars, also says that, "If you’re ready for the heightened difficulty of solo play in New Super Luigi U, then you’ll find it rewarding. Otherwise, it’s a taxing platformer that’s only made more rage-inducing in multiplayer." Chris Carter, Destructoid 8/10 "If you loved New Super Mario Bros. U., getting Luigi U is a no-brainer, as it features a collection of superior levels and an interesting re-work of Luigi as a character. If you weren't crazy about the game however, you may want to wait a bit. For those of you who have some patience, the game is launching later on in July and August (EU and US respectively) as a full standalone retail disc for $10 more that will not require the core game." Chris Schilling, Eurogamer 6/10 "What's most surprising about New Super Luigi U is that Nintendo has already proven it can transform a game through DLC. New Super Mario Bros. 2's downloadable challenge packs made a slightly lacklustre Mario game that much better, offering smart, creative twists on existing ideas. This, by comparison, just feels like an expansion pack, offering shorter, harder levels and nothing else. It's not a bad game by any stretch of the imagination: the level design is still a cut above so many of Nintendo's peers. But by the series' consistently high standards, it qualifies as a disappointment." Vince Ingenito, IGN 7.3/10 "New Super Luigi U is the chance the taller brother has waited for since being relegated to “player 2” status so many years ago. Its smaller levels, restrictive time limit, and floaty physics work well as a challenge mode add-on to an already terrific game. But as fun as it often is, this still feels more like an addendum to NSMBU – a remix, rather than something new that stands on its own." Peter Brown, GameSpot 8.5/10 "Nintendo has done a good job of creating a "new" experience out of old rags. You're still on a quest to rescue Princess Peach, and the same old Mario mechanics persist, but the challenges along the way feel different. Never have levels been this short, nor the emphasis on perfection so explicit, and these elements work in New Super Luigi U's favor. You don't need to be an expert player to save the princess, but there's room for advanced play in speed-running levels, collecting star coins, and, ultimately, tackling the legendary Rainbow Road. It can be a challenging game if you elect it to be, but it's accessible to a wide range of skill levels. The story is a compulsory component devoid of originality--unless Mario's not only missing but actually dead--and the lack of new power-ups or themes is disappointing, but underneath it all is a positively twisted take on the Mario Bros. formula, and it's an excellent add-on to New Super Mario Bros U." Thomas Whitehead, Nintendo Life 8/10 "New Super Luigi U is a terrific title for capable platform gamers, with intense and exciting bursts of momentum to put those thumbs to the test. What that does do, however, is make multiplayer even more awkward than before, and possibly puts the title beyond the reach of less experienced gamers, even with the indestructible Nabbit. The sense of the old is thankfully tempered by a fresh feel and clever level design, however, and even if the adventure won't last long for those without completionist instincts, it's fun while it lasts." As of March 31, 2014, New Super Luigi U is the 5th best selling game for the Wii U, having sold 1.76 million copies worldwide. Super Mario Bros.: Various Luigi sightings are sprites taken from this game. Super Mario 64 DS: The portrait used to enter Big Boo Battle is reused as a hidden Luigi. Super Mario World: Super Mario Advance 2: One of the Luigi sightings is a sprite of Luigi from this Super Mario World version. Luigi's Mansion: Dark Moon: The Luigi sighting in Vanishing Ghost House is based on Luigi and King Boo's artwork from this game. Super Mario 3D World: Hidden 8-bit Luigis randomly appear in levels. NES Remix 2: Hidden 8-bit Luigis appear in some of the stages. Mario's cap seen on Peach's table. Even though Nabbit helps Luigi in multiplayer mode, Nabbit still steals items from the Toad Houses, and the players will have to catch him. It will not work when Nabbit is playing in Co-op mode, and in single-player mode if the player does the trick to play as Nabbit in the level where Nabbit went, the player will still continue playing as Luigi. An in-game time unit in New Super Luigi U is 1 second, while in New Super Mario Bros. U, an in-game time unit lasts only 0.75 seconds. Mario himself is not seen, but he is referenced in three ways; in the intro, in which his hat is on the table, and in the level Broozers and Barrels, which features a Mario-based snowman at the beginning of the stage. Finally, the Mario emblem appears on the Mario Block. This makes New Super Luigi U the only game so far where Luigi appears, but Mario does not. US and Canada Club Nintendo members who purchased New Super Luigi U from the Nintendo eShop by August 1, 2013 and completed the surveys within four weeks after downloading could receive double the amount of coins (for a total of 40 coins) compared to the original amount (20 coins). They also had a chance to win 1 of 980 Luigi pins. Nyu Syupeo Ruiji U New Super Luigi U; as labeled in New Super Mario Bros. U Deluxe. This page was last edited on April 3, 2019, at 17:21.